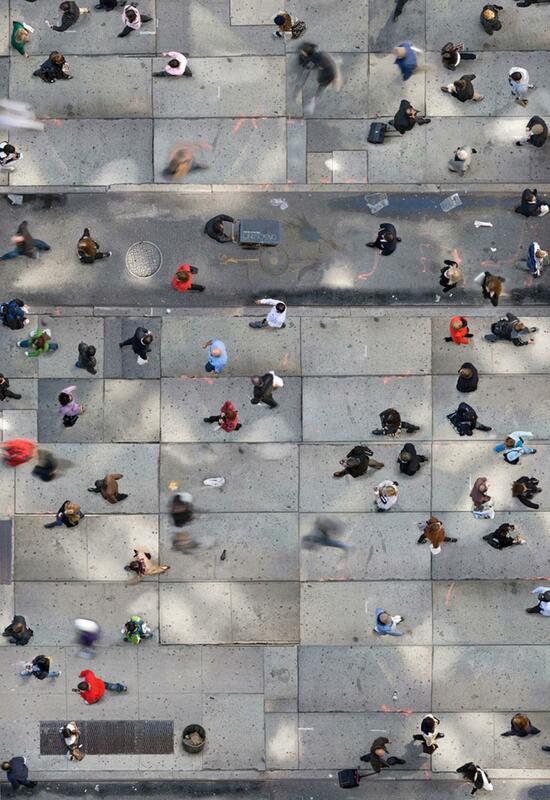 Katrin Korfmann: Aerial photography blends thousands of images from above (PHOTOS). Gravitation. Handicapped youngsters were photographed in situations in which their bodies can temporarily give up restrictions in relation to gravity. 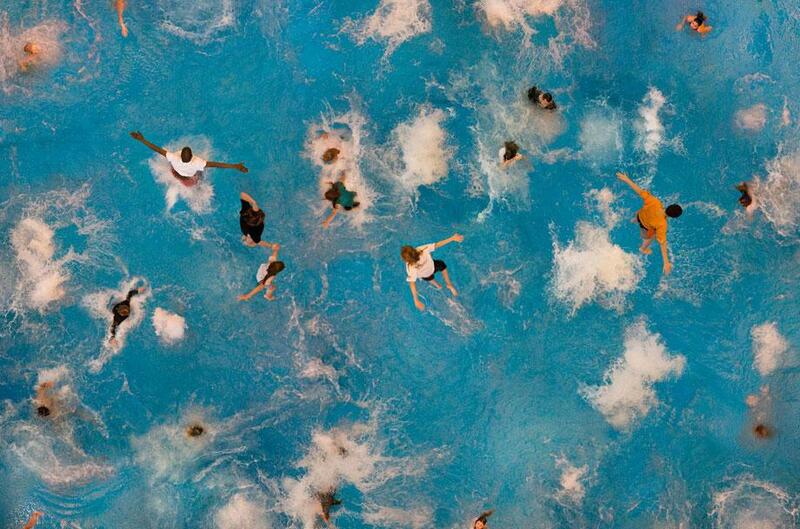 In one image we see the youngsters caught as they jump into the water. 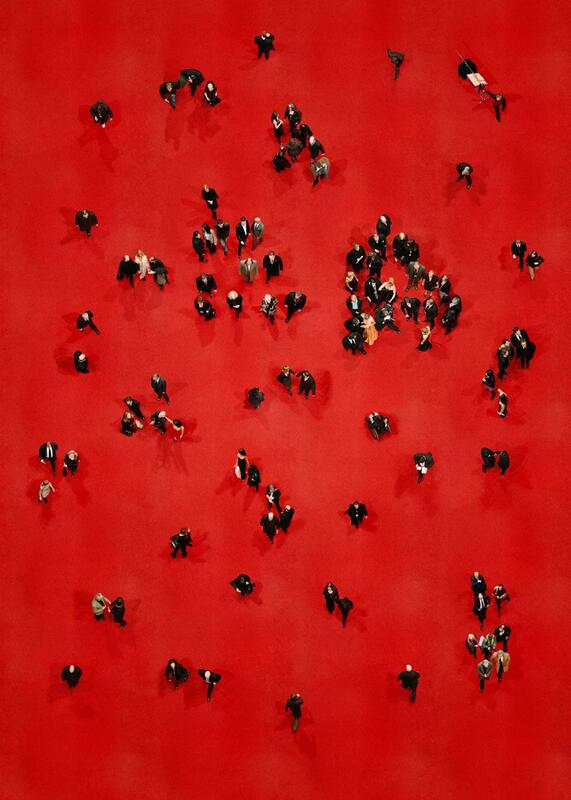 Standing at an impressive 5-feet-8-inches high, Katrin Korfmann’s photographs are hard to miss. Easier to miss—at first glance—are the details. Seen from a distance, Korfmann’s images are often mistaken for abstract paintings with bold colors and radical brushstrokes. When examined closely, those brushstrokes become snow or ice, pavement or grass, or even a red carpet; the dots are often people. 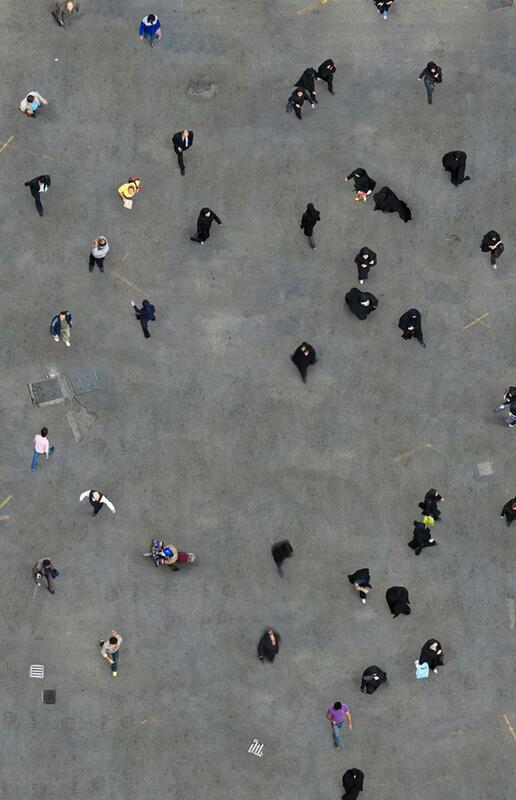 Korfmann’s work explores human similarities—when seen from hundreds of feet in the air. Korfmann’s work, Cobra, for example, could be a swooping gray brushstroke digging into a thick white impasto. 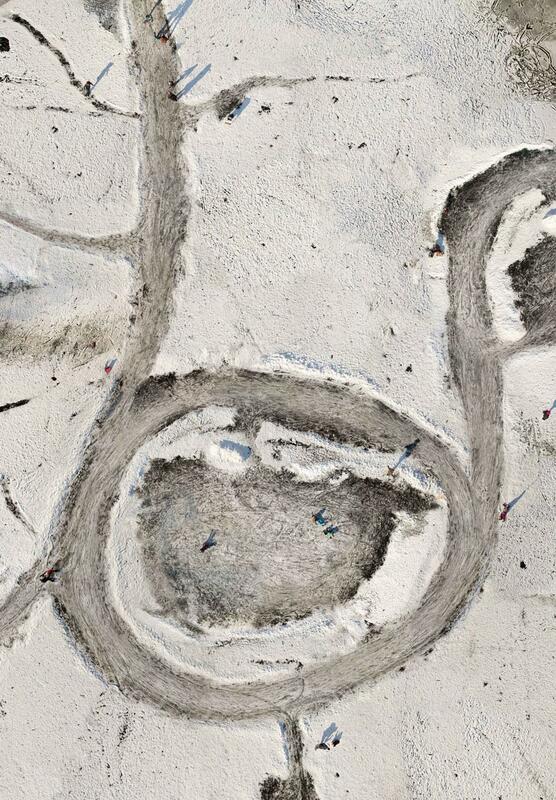 On closer inspection, though, the blobs are, in fact, skaters on a frozen pond, the brushstroke is the path swept into the snow. Waiting for Julia records three separate premières at the Berlinale, the international film festival in Berlin. Waiting for Julia (3x10 min. ), Berlin. Korfmann knows how to keep her feet on the ground. When shooting, her cameras are elevated by a crane or they are operated by her from street-level using a remote-controlled helicam. While shooting, she is constantly surveying the scene, shooting from 10 minutes to several hours. Rather than capturing a moment with one snap of the shutter, Korfmann records the experience of being in a certain place by integrating multiple images. Editing can take two or three months as she selects and blends the 500 to 2,000 shots that will make up the final image. 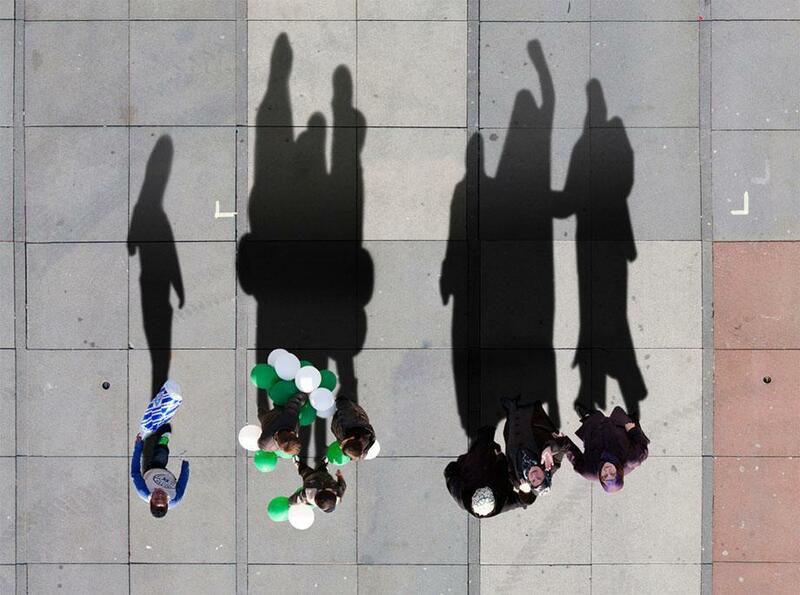 Korfmann manipulates shadows and exposure to create an image that appears to have been taken at one point in time. She titles her images with numerals that detail the number and duration of the shooting sessions. Madison Boogie Woogie (64 min. ), New York. This work reflects Manhattan’s lively pace and pays homage to Mondrian’s 1943 painting Broadway Boogie Woogie. Running With the Bulls (2x12 min. 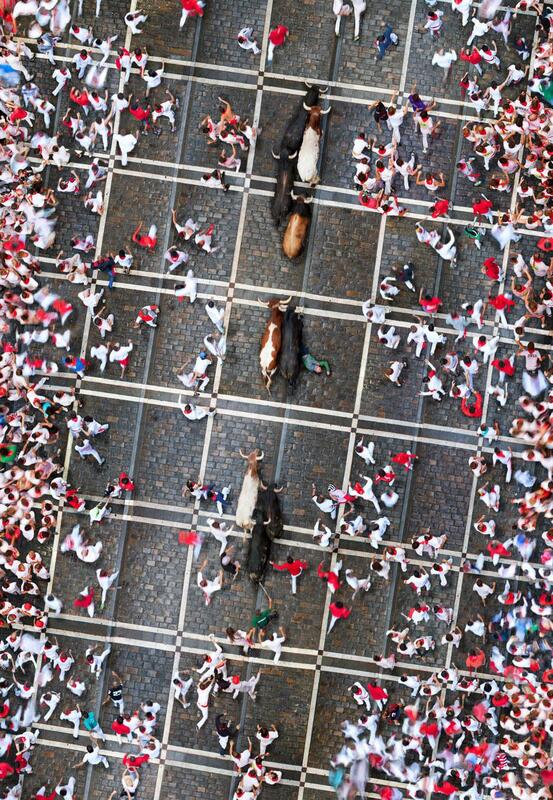 ), Pamplona, Spain. Waiting for Atousa (1 hour), Tehran, Iran, 2009. 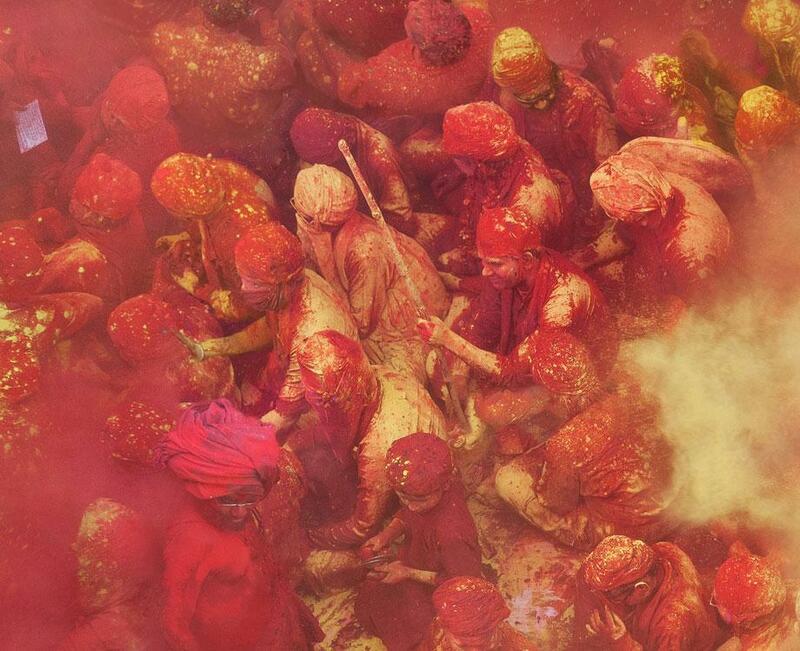 One of the issues she has explored in her photography is how people interact with the camera. In Horizon Vanished, which was taken in a square in Amsterdam, three Turkish women looked up and started to wave. “But when you see them in the shadow waving it looks like they are forming a fist,” said Korfmann. Kolorit triptych (Red, Yellow & Purple).